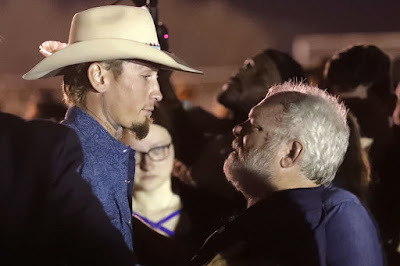 Ruth Brown at the New York Post offers a piece on the Texas men who stopped a mad gunman’s massacre. Touching new images capture the emotional reunion between the two heroes who helped stop and chase down the Texas church shooter. A tearful Stephen Willeford and Johnnie Langendorff embraced at a vigil for the massacre’s victims in Sutherland Springs on Tuesday night — before locking arms with other mourners and praying. Willeford, a neighbor of the First Baptist Church, grabbed his rifle and ran over to the house of worship barefoot when he heard gunman Devin Kelley firing at the congregation Sunday.